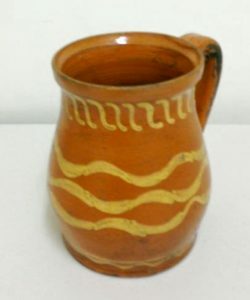 19th to early 20th C. French/German redware handled jug with free form slip decoration. 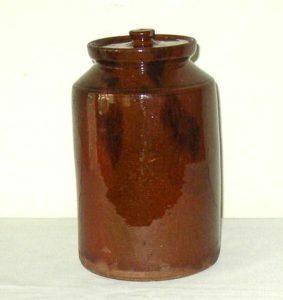 Very large mid 19th C. Redware storage jar or crock. Excellent original condition. Red/brown glaze with random spots of manganese decoration. PA origin. 12 1/4″ tall. 19th C. sewer tile dog, probably Ohio origin. 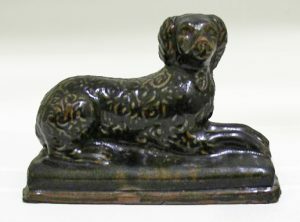 The dog is well formed and nicely highlighted with a lighter brown. 9″ Long and 6″ high to the top of his head. 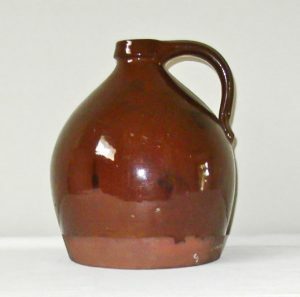 Nicely shaped 19th C. Redware Jug with strap handle. Reddish brown ground glaze with dark manganese decoration. Excellent original condition. 9 1/2″ tall, 8″ diameter. 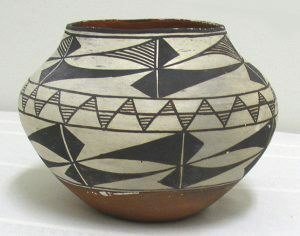 A nice Acoma pot in the traditional cream, terra cotta and black colors. Good natural wear. 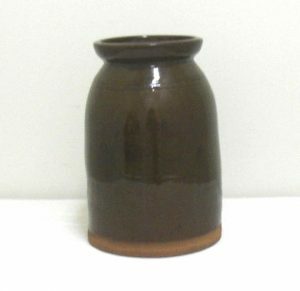 Early to Mid 20th C. 6 1/2″ high with a 5″ Diameter opening in the top. 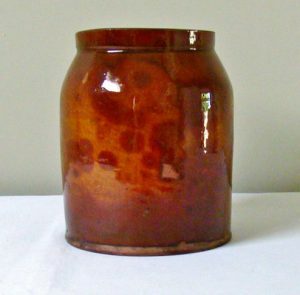 Colorful 19th C. Redware storage jar or crock with a yellow-orange base glaze with a bright mottled red-orange overglaze for decoration. 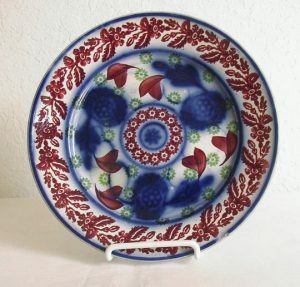 Very good original condition with 2 small spots with glaze loss. 6 1/2″ tall, 5 3/8″ wide. 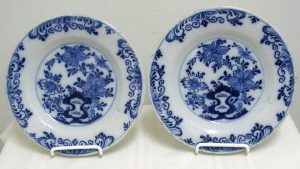 A noteworthy pair of 18th C pictorial Dutch Delft chargers of large size (13.75” diameter) with beautiful artwork and colors of manganese and yellow on a white glaze ground. Both chargers are in excellent condition with no cracks, hairlines, chips or restoration. One charger has a scene of “Adam and Eve” and the other has a scene of Noah’s Ark. Both have a wonderfully graphic border of tulips and leaves. They both came from a Dutch collection. Gaudy stick spatter and flowing blue decorated service plate. No maker’s mark. 9 1/4″ diameter. Very fine condition with no damage or restoration. A nice clean example. Mid 19th C.